Bias alert! I’m doing this series because I don’t generally like California chardonnays — so if I can recommend one, it’s probably good enough for most people. I am not a normal, impartial judge of this kind of wine. Bottom line: The most intense white wine I’ve ever tasted. Unless you’re a crazed California chard fanatic who is looking for the fringe of possible chardonnay flavors, this wine is not recommended. GAAKK!!! SCHUG chardonnay may be “respecting the fruit and regional character of each variatal,” but this stuff is VERY challenging to drink right after you open it. Positively face-wilting with sour flavors, it just defies you to bring it to your lips for a second try. However, as I explain below, it gets MUCH better on day 2 and could be fascinating to a die-hard California chardonnay fan. Right after opening, for me the smell was the worst part, reminding your Wineguider of urine and rotting flowers. On day 2, it definitely got better, with some minerality, citrus and green apple, but it was still VERY intense. Is this stuff awful, or stellar and academy-award-winning? I’m not sure! All I know is, it’s way, way out there. The smell improved on day 2 as well, morphing into a pleasant combination of light tropical fruits. And I have to give some serious “props” to SCHUG chardonnay: UNlike most California chards, it tastes very organic and very natural. If I were really into California chardonnay, I could see loving this stuff. It’s quirky. It’s off the beaten path. It’s intense. It makes a very serious statement. Continuing our marathon California chardonnay week, we look at a $13 contender from 2009 that is unoaked and seems to be available only at Total Wine. 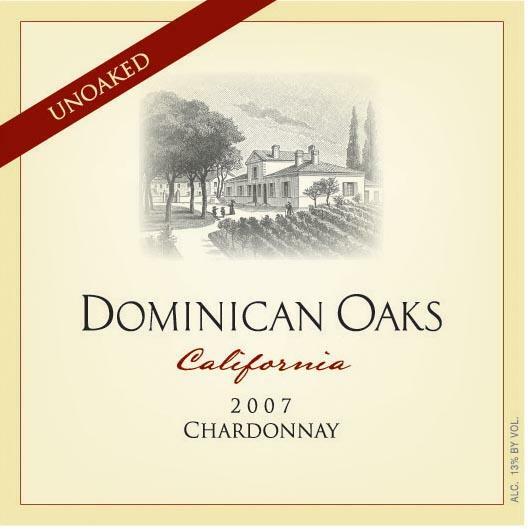 The Dominican Oaks Unoaked chardonnay wins BOTH “most contradictory name” and “best chardonnay under $20” in our reviews so far. It smells like honeysuckles (if you aren’t familiar with this plant, it is a divine aroma). Not terribly complex, but very clean. It’s balanced: you get some minerally tartness, and some light sweetness. Flavors concentrate on lemon-lime and peach. It’s light, easy to drink, delicious, and its taste is refreshingly natural. And note: winning “best chardonnay under $20” means that Dominican Oaks Unoaked is better than the $6 Jacob’s Creek, which sounds like faint praise except that the turbocharged value machine Jacob’s Creek has beaten every single chardonnay that we have reviewed from California, at any price, except William Hill. We continue our special California chardonnay week with this coveted $42 wine from Napa Valley’s 2007 vintage. Am I crazy?? This $42 (sometimes $53) (but look here — just $32.98) chardonnay, thought to be one of the best in the U.S., isn’t good enough?? The wine that I actually saw two grown men fight over in an Atlanta liquor store that had only 1 bottle left (one of whom turned out to be my dentist!)?? First, Cakebread was better than this week’s previous (low-dollar) contenders. We had high hopes, because this chard was one of the best in Napa Valley when I visited Cakebread‘s winery in 2004. But it seems oakier and more buttery now. Our first drink made us grimace uncontrollably. It tasted like the fake, clogged-up stuff you get when you absentmindedly order “white wine” at some stupid work-related event. The smell was VERY oaky and buttery. Decanting didn’t help — still tasted like an improved version of Clos du Bois, which we dissed here. But on day 2, things improved a lot. NOW this golden boy began to act right — a smell of honeysuckles and a taste of (acidic) lemon/lime, countered by (sweet) honeydew melon and cantaloupe. And a hint of oak, which combined with the citrus to zap your tongue with a mildly spicy “zing!” Wow — a natural-tasting, balanced, white wine. LET’S GET READY TO RUMMM-BLLLLE!!!! Today we continue our special California chardonnay week by reviewing the Clos du Bois 2009 chardonnay, which will cost you $12. Et tu, Clos du Bois? This is the THIRD DAMN California chardonnay I’ve auditioned this week, and I can’t find one that I would buy again. What’s up, ladies and gentlemen? I guess I am just too cheap and too optimistic, as I have now tried chards priced at $11, $8, and $12. What I got here was an aroma of “standard California chardonnay,” and a taste of — this was a shocker — “standard California chardonnay.” Admittedly, it tastes cleaner than Bogle or Kendall-Jackson. In fact Clos du Bois is not horrible, and does not slap you with grimace-producing chemical flavors, but the problem is, there’s just no reason to keep drinking it. Pale yellow in color, it had notes of oak, butter, grilled pears, broasted pineapple . . . oh who cares? Life is meaningless! (Sorry about that.) And check this out: after 3 days in the fridge, this chardonnay transformed into some kind of flavored water. Monday night, when first opened: blah chardonnay. Thursday afternoon: yellow sports drink. I’m having some right now. Nothing. It’s vaguely buttery, and has a light spice. Whatever. The second contender in California chardonnay week is the 2009 Bogle Vineyards at $8. That’s $3 less than the almighty Kendall-Jackson (which we rejected for tasting like a bunch of chemicals and for its unrelenting mediumness). “WHOA.” That was my first reaction. This stuff is truly intense. It smelled like sweet mangos, butterscotch, and lemon — far more interesting than the Kendall-Jackson factory. The taste? Oaky and buttery . . . lemon and green apple acidity . . . butterscotch, melon, cream, some real sweetness . . . and, like Kendall-Jackson, the feeling that I was ingesting random chemicals. At least it’s a little spicy. That was my favorite part about this bargain white wine. Bogle is a cool winery. It’s family-owned. They keep the price of this wine really low (which is a mystery, because it’s at least as good as Kendall-Jackson). And I hear great things about their bargain cabernet and “ThePhantom” red blend. But I can’t recommend this chard. Which isn’t surprising because, as I’ve said, I generally don’t like California chardonnays. I wouldn’t go as far as this guy, who called the 2004 Bogle chard “undrinkable,” but I can’t agree with this other guy who said it was his favorite chard under $10. Wow. As for me, it really smells wonderful, but this intense California chardonnay is, unfortunately, not recommended. Guess what!!? In this review, we kick off a feature: California chardonnay week! Why? Because I couldn’t find a hammer to smash myself in the face with? No, I’m doing this because (1) California chardonnays are incredibly popular, and (2) I dislike them so much, that if I can recommend even one with a straight face, it’s likely to be really damn good. here (“one of my favorite white wines”). How does it taste? Not so great. But not terrible. The first word I wrote when tasting this medium-bodied yellow fluid: “chemicals.” It’s oaky, and buttery, but not excessively so. It has strong sweetness with vanilla, pear and melon, and medium acidity with citrusy something-or-other. The overall message is: extremely medium. If I needed a good California chardonnay, I’d definitely spend the extra bucks and get William Hill, which I reviewed right here. Jacob’s Creek 2009 chardonnay review – WHAT THE? Today we look at a chardonnay from Australia that will cost you only 6 bucks. I can’t restrain myself, ladies and gentlemen, this white wine from south-eastern Australia is AWE-SOME. At a price that is almost laughable, you get a smooth white wine with some real character. A crisp, tart, tangy, enjoyable wine with some true chardonnay taste and aromas, combined with a little extra citrus and minerality, yet almost no oak and almost no butter. Almost nothing like a typical California chardonnay, it actually acts more like a sauvignon blanc in some ways. I literally can’t stop drinking it. Now I admit, Jacob’s Creek 2009 chardonnay is strange in one way: one bottle that I bought had a screw top. Another one had a cork. Same wine. Same year. Same STORE. What the hell!? I don’t know, but I can tell you this: the bottle with the cork tasted better. It was smoother. And it lacked the slightly over-tart, slightly kerosene-tinged character of the screw top. But most importantly: both bottles were incredible for a $6 wine.